More often than should be the case, I get distracted by Google and start looking into something or someone who just happens to cross my mind. Most recently it was Jocko Henderson. By the late fifties, the hounds of change were on radio's traces. Television was seizing for itself the stories, the vaudeville and the sense of being there that had been the heart of radio. And into the void was moving a new kind of music called rock 'n' roll. The Silhouettes - Douglas "Jocko" Henderson, "The Ace from Outer Space", was a pioneering radio broadcaster whose career spanned five decades. 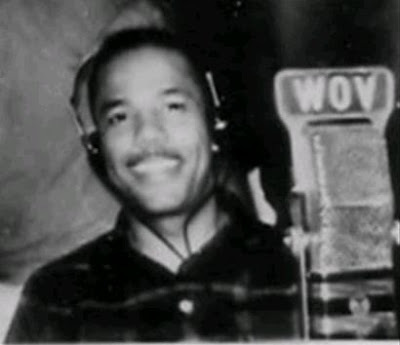 Born in Baltimore in 1918, Jocko began his broadcasting career in 1952 on radio station WSID. The next year he moved to WHAT in Philadelphia, adopted his enduring nickname, and a few months later went to WDAS, developing a rhyming style of delivery that can be seen as a forerunner of many later rap artists. "This is your ace... from outer space... not the duplicator... not the imitator... not the impersonator... but the originator!" Jocko played rhythm and blues music - with no station-imposed playlist - and his Rocket Ship Show was immensely popular. As his fame spread he did shows that aired in Boston, Detroit, Washington DC, St Louis and Miami, and at one time regularly did a daytime show in Philadelphia and an evening one in New York. Jocko Henderson died aged 82 in July 2000. Broadcast Pioneers - "Hello, Daddy-O and Mommy-O, This is Jocko" was all the rage in Philadelphia and later in New York City. His thing was rhyming words like, "eee-tiddlee-yock, this is the Jock," or "oo-papa-doo, how do you do." While not the first to do this, it worked. Word has it that his fan club numbered 50,000 people at one time. ...After running unsuccessfully for the United States Congress in the Second District in 1978, he spent much of his efforts promoting his "Get Ready" program for school districts around the country. Jocko made records of himself teaching our youth everything from math to American history with rap lyrics. I'm from England. I'm England's first rapper, the original English rapper. The first rap that reached England was 'rapper's delight' then 'christmas rapping' then 'rhythm talk' by Jocko.... All I remember is the bits you quoted plus 'I'm the middleweight champ at 163, you've gotta be bad to hang with me'. I can still here him saying, and me hanging on his every word, "HICKORY DICKORY DOCK; THE MOUSE RAN UP THE CLOCK BUT AT 12 05 TO HIS RADIO HE DIVED AND SAID.LET'S RETURN TO THE JOCK."